SEO is an important aspect for any webmaster since good ranking in the search engine assures heavy traffic to your website thus gaining lot of profit at the end of the day. To attain better rankings, there are some important ranking factors of SEO to be taken care of and speed of your website is definitely one of them. To make sure that your site load faster whenever any user is visiting your website, you need to comply to all specified set of rules and regulation those are predefined by search engine giants such as Google or Bing. The term ‘Minify’ is used to describe a method which makes your website file size smaller. It achieves this goal by removing white spaces, lines, and unnecessary characters from the source code. The obvious advantage of minifying files is improved WordPress speed and performance. Compact files are faster to load and improve your site’s speed. However, some experts believe that the performance improvement is very small for most websites and not worth the trouble. The minification only decreases few kilobytes of data on most WordPress sites. You can reduce more pageload time by simply optimizing images for web. First thing you need to do is install and activate the Better WordPress Minify plugin. 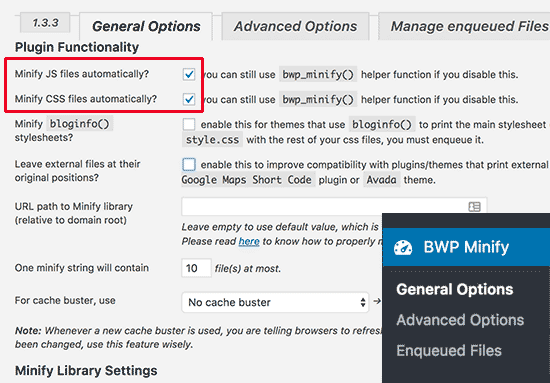 Upon activation, the plugin will add a new menu item labeled ‘BWP Minify’ to your WordPress admin bar. Clicking on it will take you to plugin’s settings page. You can now click on the Save Changes button to store your settings. There are many other advanced options on this page. The default settings will work for most websites, but you can review and change these options on a case by case basis. Next, you need to head over to your website. Right click anywhere and then select ‘View Page Source’ from browser menu. That’s all, we hope this article helped you learn how to minify your WordPress site. You may also want to see our ultimate guide on how to speed up WordPress for beginners. Hope you are enjoying our blog posts. In case if you have missed reading, go through Top 10 Most Illustrated Web Designs or Top 10 Ways To Get More Views On YouTube Videos.Most Common Web Design Mistakes – Coffin For A Website is a monstrous dream for any web designer. Many thanks Danish – nice and easy to follow and an excellent description.